Starting from the best pose provided by the HADDOCK procedure, we want to exploit the capability of CPMD1 and in particular its QM/MM approach in order to get a guess of the topology of the covalent complex. Some questions displayed in orange are supposed to be answered by the reader. you will notice that the large majority of the H atoms are missing. Only three H atoms are present in the structure. However, HAA and HBB are bound to the N atoms of the piperazine ring and their protonation is debatable. The suite can be downloaded after a free registration, and the protonation analysis workflow is available without any license. Drawing a molecule is rather intuitive and will be left to the reader discover the details and have fun with that. Remember that the ligand has a piperazine and cyclohexane rings at its ends. 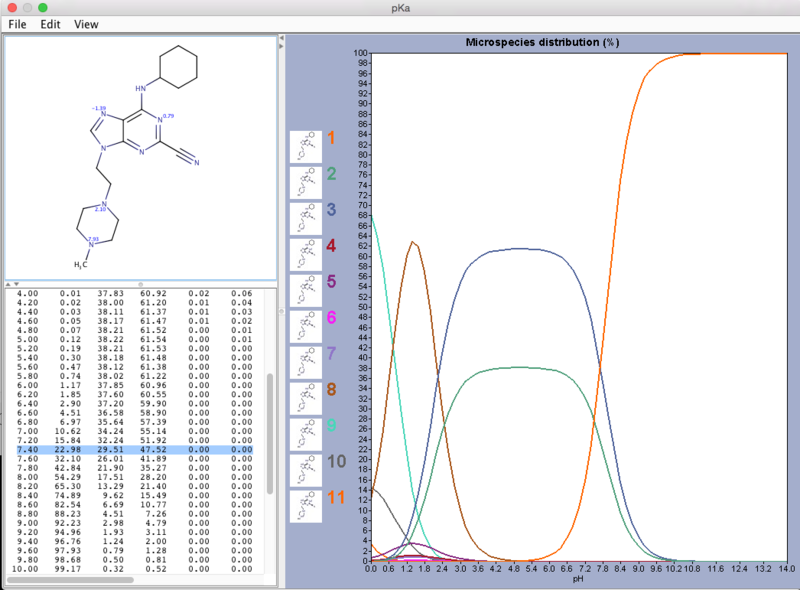 After drawing the molecule, if the structure is chemically consistent (no pink clouds within the structure) we can move to calculate the pKa by selecting Calculations/Protonation/pKa from the menu bar. Keep all the default parameters and press OK (twice). Keep all the default parameters and press OK.
Chimera uses atom and residue names, or if these are not “standard”, atomic coordinates, to determine connectivity and atom types; the atom types are then used to determine the number of H atoms to be added and their positions. The positions of pre-existing atoms are not changed, but any lone pairs and unidentifiable-element atoms are deleted. Type simply the command name pdb4amber to get a short description of the options of the command7. 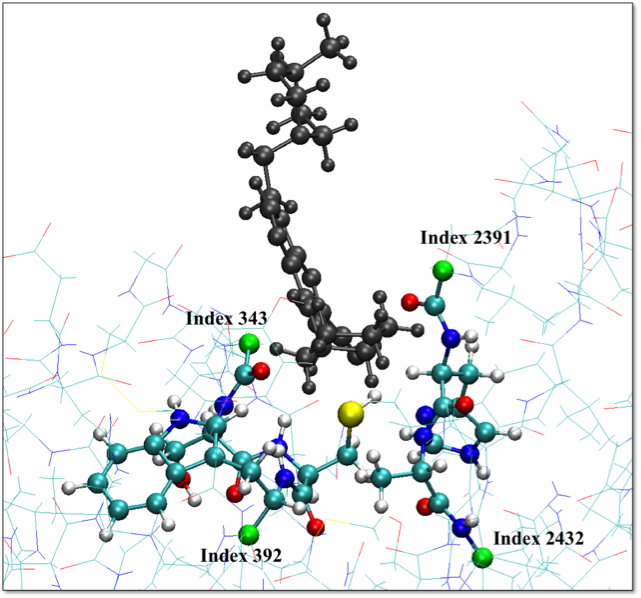 In fact, AMBER does not follow the PDB standard atom name convention and a name remapping for some H atoms would be needed to get the PDB correctly recognized by the tleap program of AmberTools (see below). Removing the H atoms allows us to overcome the issue without compromising accuracy: the H atoms will be added in standard positions later by the tleap tool itself and the subsequent equilibration phase needed to correctly solvate the system will provide compatible H atom positions. The (old) QM/MM interface of CPMD we will use in this tutorial can deal with AMBER or GROMOS force fields. For our aim, the AMBER force field is more suitable. Therefore, we need to build the topology file for our system in AMBER format. We will perform this task with the AmberTools suite. After few seconds of calculations the sqm code called by antechamber will produce the file ligandH.prepin that contains the AM1-BCC partial charges together with the atom and bond types derived from the GAFF (Generalized Amber Force Field) library for the atoms and bonds of the ligand residue UNK. Actually, antechamber calls several programs in sequence that produce many intermediate files in your directory: the option “-pf y” removes them at the end of the process. As already mentioned, use the –h option or type simply the command name antechamber to get a short description of all the options recognized by antechamber and to understand the meaning of each option employed in the instruction above. In addition, you can use antechamber –L to list the supported file formats and charge methods. where the file leaprc.protein.ff99SB is used to load all the libraries containing the parameters of the AMBER force field ff99SB that we are going to use in this tutorial. In fact, the QM/MM interface of CPMD has been mainly validated mainly by using this force field and it is a good standard for our aim9. Moreover, the conversion script that we will provide you to convert the AMBER topology file to a GROMOS one readable by the QM/MM interface in CPMD (see later) has been developed specifically for this force field. 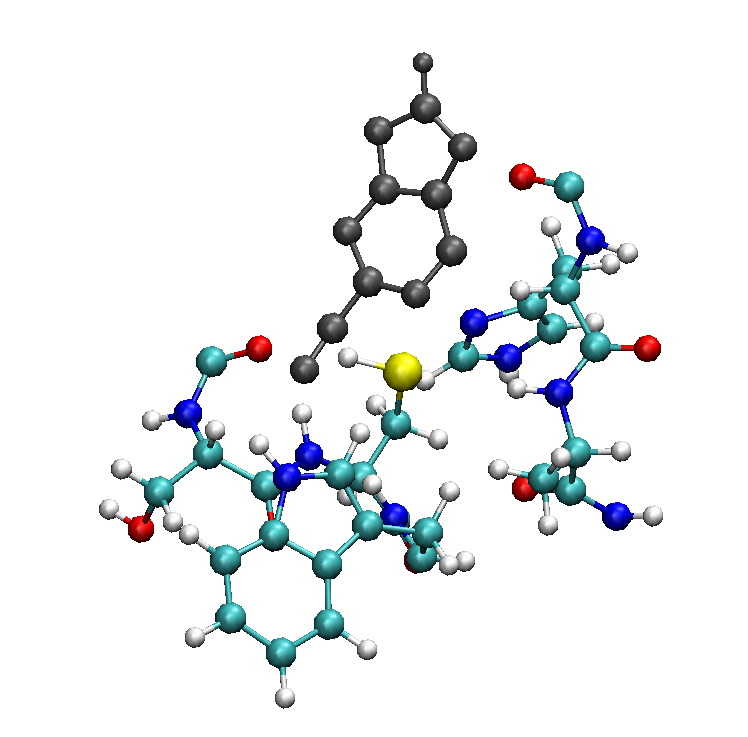 This is due to precision accuracy in the ligand parameterization and it can be ignored. where “0” instructs addions to neutralize the unit. The first command loads the library with the solvent parameters and in particular the parameters for the classical “TIP3P” water model11 that we have used in the second command. In the second command an orthorhombic box whose walls are at least 14 Å from any atom of the complex system is created around the system and fulfilled by TIP3P water molecules. can appear close to the end of the log file eq_restraint.out. This means that the minimizer got “stuck” in a place from which the minimization algorithm could not find a way out. Unless there is something very askew with the system (visual inspection of the system is always the first check), the amount of minimization that has occurred by the time you reach such a “sticking” point will be sufficient to move on to the next step. Now, we rise the system temperature to 300 K through a linear heating with a MD simulation at constant volume. In this step we restrain weakly the protein and ligand molecules to the initial position so that water can spread all around the complex without forming “holes”. This and the following simulations can require much longer time than the previous steps. Is the temperature stable at 300 K? Is the system well-equilibrated? Which quantities can you look at to assess this? Why is density slightly larger than 1 g/cm3? A poor initial pose: additional work on the HADDOCK parameters here would be needed. An unsuitable force field: force fields are continuously updated and in principle the newer ones should be preferred. But as we also mentioned in footnote 9, this is not always true and one should always preliminarily go through the literature regarding his system and then choose the force field that has proved to provide the better results. The semi-empirical parameterization of the ligand, and in particular its partial charges: there are more accurate methods to perform this step, in particular the one that require more expensive quantum chemistry calculations to get the electric potential around the ligand. 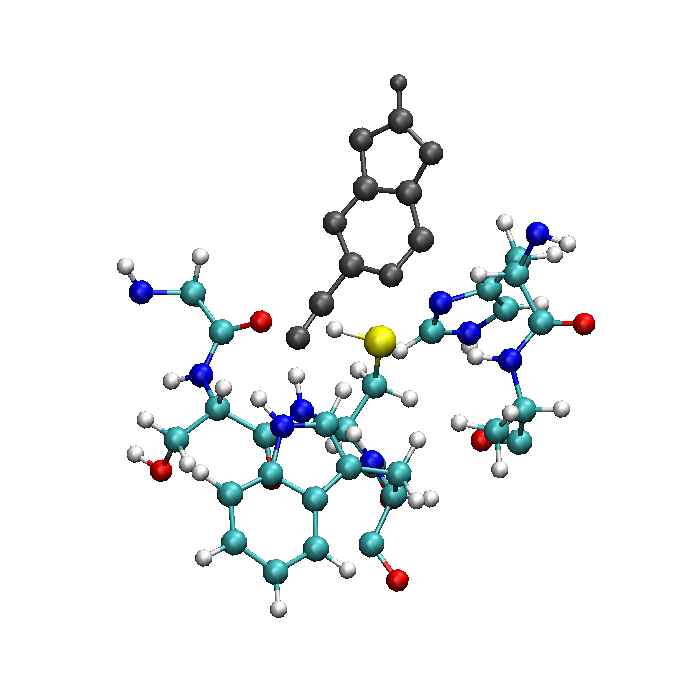 See for example the other CPMD QM/MM tutorial investigating the acetone molecule in water solvent. the pose is intrinsically instable at force-field level: in fact, it could be the case that non-bonding interactions are not enough to keep the ligand/protein complex in that position and that only the covalent bonding (not imposed/obtainable in our current level of description) could allow the formation of such complex. Therefore, at this stage the best one can do is repeat the equilibration by employing restrains specifically design to maintain the desire relative positions between the ligand and the protein. As an example, we provide input files with the name suffix “_constraint” that allows one to perform the same equilibration steps described above and in addition include a distance restraint between the nitrile carbon atom of the ligand and the sulfur atom of CYS25. What happened to our orthorhombic box? The picture above has been obtained with VMD by selecting (in the Display menu) the Orthographic display mode in place of the default Perspective one. The option “solvate” allows one to specify that the water molecules should be treated as solvent ones: this is useful only if you are interested to read in the CPMD log file energies and other quantities partitioned in solute and solvent components. These 3 files are ready for a QM/MM MD simulation. However, some changes in those files could be necessary in order to correctly set up the simulation. Below we describe the most relevant sections15 of these files that need to be verified. Note that the amber12togromos.x code provides a gromos.inp file with fully commented sections. The first number should be 0 for isolated system; >0 if PBC in parallelepiped box has been used; <0 if PBC in octahedral box has been used. The following 3 numbers are the sizes of the box that can be read at the end of gromos.crd file. 90.0 is the angle between the x and z axis of the box. The last number is ignored by CPMD in QM/MM simulations. Number of (different) solute molecules18. Index of the last atom of the first solute molecule. Index of the last atom of the second solute molecule. In the section PRINT you may want to modify the first number, which is the number of steps after that CPMD writes info of the energy in the output file (100 is usually enough). The system we want to study contains 40,554 atoms. With the current computational architectures, a full quantum description of a system of this size is far beyond the capabilities of any QM code. The largest systems that so far have been fully treated at quantum level are order of 5,000 atoms. This is the reason why we need to resort to QM/MM approaches to deal with such large systems and at the same time having the possibility to treat at quantum level the part(s) that require the inclusion of the electronic degrees of freedom for a correct description (e.g. for the description of chemical reactions). Usually, the computational load of a QM/MM calculation is dominated by the size of the QM part. Therefore, the QM part should be as small as possible, but at the same time it should of course include all the regions that are important (e.g. the ones involved in the chemical reaction) or potentially important (e.g. the ones whose polarization has an effect on the phenomenon under investigation) to be treated at quantum level. How should the QM part for our system be selected? Not belonging to conjugated or aromatic moieties in order to avoid cutting over π molecular orbitals. Use VMD to understand how the final QM part has been determined and which bonds are cut. Before concluding this section about the selection of the QM part, it is important to highlight an important point. The computational load of a QM or QM/MM simulation depends on the size of the basis set employed. In the case of QM codes employing a “localized” basis set (e.g. 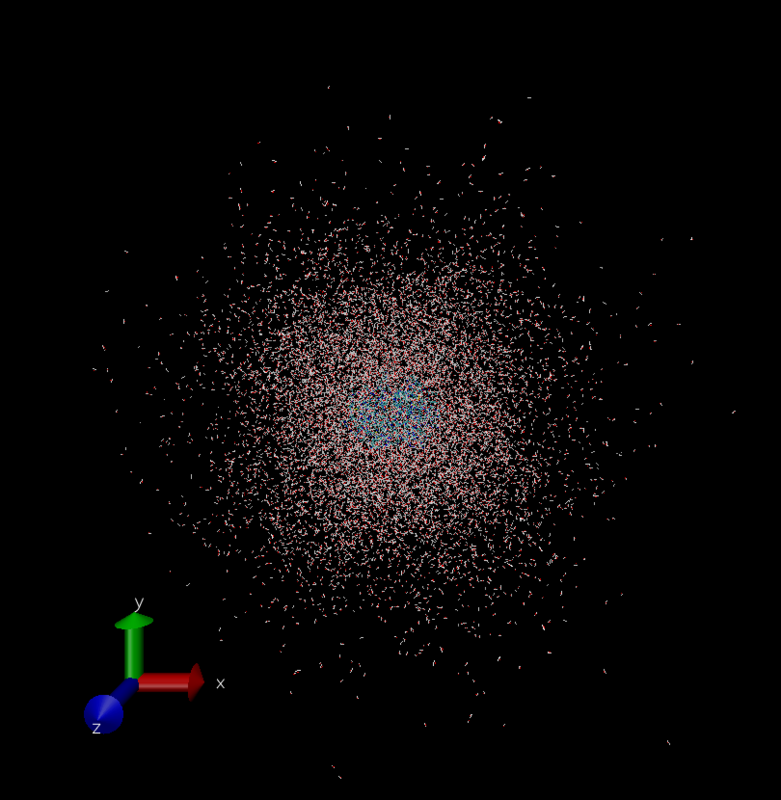 Gaussian2016), the computational cost is proportional to the number of atoms. However, CPMD expands the system wavefunction over a “plain waves” basis set. This means that the computational load is not proportional to the number of atoms inside the cell but to the size of box itself. Therefore, once fixed the size of the QM simulation box, for CPMD it does not matter (from the computational point of view) how many atoms inside the box you will treat at quantum mechanical level, i.e. how many atoms inside the box you will add in the input file! What is relevant for the computational cost point of view is only the size of box. With the AMBER package we have built the system and the files needed to describe the “MM” part, i.e. the part of the system that in a QM/MM simulation is described at force field level. The next step to setup a QM/MM simulation with CPMD is to write the input file of CPMD. This file is the place where to specify 1) the QM part, 2) the details of the QM/MM simulation. Describes explicitly (degrees of freedom) only the valence electrons and uses the pseudopotentials to approximate the effect of the neglected core electrons over the valence ones. We cannot enter here in the details of DFT and its implementation in CPMD19 and in what follows the basics of the theory are supposed to be known. This input file starts with an (optional) &INFO section. This section allows you to put comments about the calculation into the input file and they will be repeated in the output file. This can be very useful to identify and match your input and output files. The first part of the &CPMD section instructs the program about the kind of job to perform. In the case of the example, a geometry optimization (XYZ option specifies you want the final structure also in xyz format in a file called GEOMETRY.xyz and a ’trajectory’ of the optimization in a file named GEO_OPT.xyz) with a tight wavefunction and geometry convergence criterions respectively (default 10-5 and 5*10-4) is requested. The &SYSTEM section contains various parameters related to the simulation cell and the representation of the electronic structure. The keywords SYMMETRY, CELL and CUTOFF are required and define the (periodic) symmetry, the shape and size of the simulation box (x, y, z, cos(xy), cos(xz), cos(yz)), as well as the plane wave energy cutoff (i.e. the size of the basis set), respectively. The keyword ANGSTROM specifies that the atomic coordinates, the (super)cell (quantum box) parameters and several other parameters are read in Ångströms (pay attention: default is atomic units (a.u.) which are always used internally). 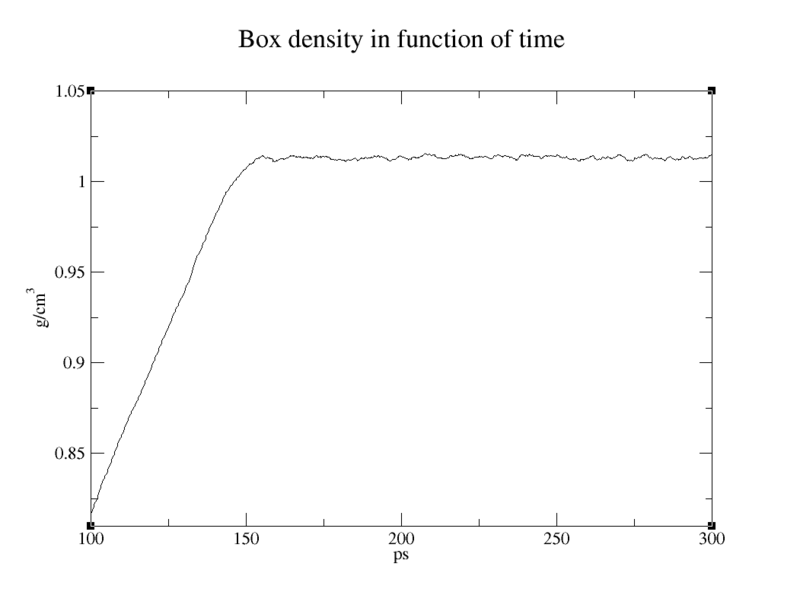 The (quantum) simulation box has to be large enough to include the large majority of the electronic density of the system. In order to verify if the box size is large enough, one usually performs convergence tests by focusing on quantities like the total energy. CPMD uses the Density Functional Theory (DFT) to solve the quantum problem. The &DFT section is used to select the density functional (FUNCTIONAL) and its related parameters. In the case of the example the gradient corrected BLYP functional20 is employed (local density approximation is the default). Finally, the &ATOMS section is needed to specify the atom coordinates and the pseudopotential(s), that are used to represent them. The input for a new atom type is started with a “*” in the first column. This line further contains the file name where to find the information for the corresponding pseudopotential, and several other possible labels such as KLEINMAN-BYLANDER in the example, which specifies the method to be used for the calculation of the nonlocal parts of the pseudopotential (this approximation make the nonlocal parts calculation extremely fast but it keeps also in general high accuracy). The collection of pseudopotential files is available for CPMD. We provide in the tutorial subfolder 7-Preparing_the_QM_files_for_CPMD and the ones necessary to describe the atoms of this system. The next line contains information on the nonlocality of the pseudopotential: you can specify the maximum l-quantum number terms that CPMD will take into account in the calculations with LMAX= l where l is S for l =0, P for l =1, D for l =2, and so on21. For each pseudopotential, the information of only a limited number of l-quantum number terms has been stored in its file. You can verify how many l-quantum number terms are available by opening the pseudopotential file and looking at the number of columns in the section &WAVEFUNCTION: the first column is the distance from the nucleus, while the other columns are the data for l =0, l =1, l=2… Of course, larger is LMAX, more expensive will be the computation. On the following lines the coordinates for this atomic species have to be given. The first line gives the number of atoms of the current type. In the &CPMD section the QMMM keyword has to be added. A new &QMMM section, which we will explain in detail below, is mandatory. and in a similar way for the other atomic species (“H”, “”N”, “O”, “S”). The ANGSTROM keyword in the &SYSTEM section cannot be used, so any length has to be specified in a.u. The QM system in a QM/MM calculation can only be dealt as isolated system, i.e. without explicit PBC since there is the MM environment all round it. Even though we are requesting an isolated system calculation (SYMMETRY keyword with the option ISOLATED SYSTEM or 0), the calculation is, in fact, still done in a periodic cell (we are still using a plane wave basis set to expand the wavefunction of the QM part!). Biological molecules are charged or they have a dipole moment, therefore we have to take care of the long-range interactions between periodic images and there are methods (activated with the keyword POISSON SOLVER in the &SYSTEM section) implemented in CPMD to compensate for this effect. We will choose the TUCKERMAN Poisson solver22 since it has been proven to be the most effective one with typical systems studied in biology. Decoupling of the electrostatic images in the Poisson solver requires increasing the box size over the dimension of the molecule: practical experience shows that 3.5 Å between the outmost atoms and the box walls is usually sufficient for typical biological systems. More information about the solver can be found on the CPMD manual23. TOPOLOGY: On the next line the name of a GROMOS topology file has to be given. COORDINATES: On the next line the name of a GROMOS96 format coordinate file has to be given. INPUT: On the next line the name of a GROMOS input file has to be given. AMBER: An Amber functional form for the classical force field is used (if this keyword is not specified, the default is the GROMOS functional form). ELECTROSTATIC COUPLING: The electrostatic interaction of the quantum (QM) system with the classical (MM) system is explicitly kept into account for all classical atoms at a distance r ≤ RCUT_NN from any quantum atom and for all the MM atoms at a distance of RCUT_NN < r ≤ RCUT_MIX and a charge larger than 0.1e (NN atoms). MM atoms with a charge smaller than 0.1e and a distance of RCUT_NN < r ≤ RCUT_MIX, and all MM atoms with RCUT_MIX < r ≤ RCUT_ESP are coupled to the QM system by a ESP coupling Hamiltonian (EC atoms). If the additional LONG RANGE keyword is specified, the interaction of the QM system with the rest of the MM atoms is explicitly kept into account via interacting with a multipole expansion for the QM system up to quadrupolar order. A file named MULTIPOLE is produced. If LONG RANGE is omitted the quantum system is coupled to the classical atoms not in the NN-area and in the EC-area list via the force-field charges. If the keyword ELECTROSTATIC COUPLING is omitted, all classical atoms are coupled to the quantum system by the force field charges (mechanical coupling): computational expensive calculation! RCUT_NN: The cutoff distance for atoms in the nearest neighbor region from the QM system is read from the next line. We will use the default value of 10 a.u. RCUT_MIX: The cutoff distance for atoms in the intermediate region is read from the next line. We will use the value of 15 a.u. RCUT_ESP: The cutoff distance for atoms in the ESP-area is read from the next line. We will use the value of 20 a.u. UPDATE LIST: On the next line the number of MD steps between updates of the various lists of atoms for ELECTROSTATIC COUPLING is given. At every list update a file INTERACTING_NEW.pdb is created (and overwritten). SAMPLE INTERACTING: The sampling rate for writing a trajectory of the interacting subsystem is read from the next line. With the additional OFF keyword or a sampling rate of 0, those trajectories are not written. As we have already mentioned in the previous section, whenever the QM/MM boundary cuts through an existing bond, special care has to be taken to make sure that the electronic structure of the QM-subsystem is a good representation of the one we would get with a full QM calculation, and also that the structure in the boundary region is preserved. So far, two different approaches have been implemented in CPMD: the hydrogen capping and the special link-atom pseudopotentials. The former, that is described in the CPMD manual25, is a bit laborious to setup and it is very useful when the classical atom at one end of the cut bond is not a carbon atom. The latter has been further improved and optimized with the method26 described in and it is currently the most popular one. It consists in placing a scaled down optimized pseudopotential with the required valence change (usually ZV=1 since cutting through a single bond) in place of classical atom. Currently, the optimized monovalent pseudopotential for replacing a carbon atom has been developed “C_GIA_DUM_AN_BLYP.oecp” and it is provided in the tutorial subfolder 7-Preparing_the_QM_files_for_CPMD together with all the other pseudopotential files associated to the atomic species present in the system investigated in this tutorial. Note that the addition of these 4 atoms in the QM part has to be taken into account when we calculate the size of the quantum simulation box! There is no potential energy barrier for the chemical reaction. In this case a geometry optimization or as we will see in a short a simulating annealing could be enough to get an initial topology for our complex. There is a free energy barrier of order of kBT. 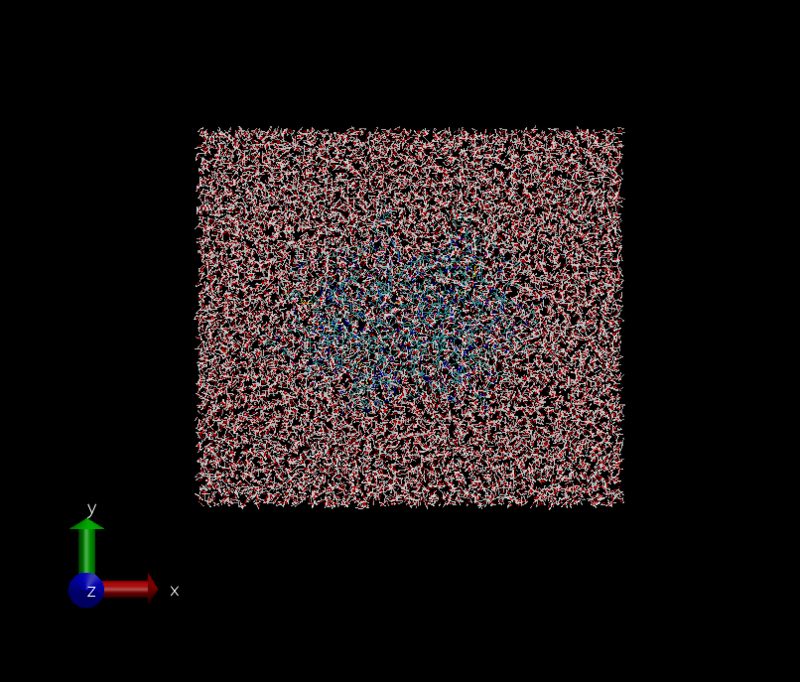 In this case, after the initial simulating annealing, we need to setup a quantum molecular dynamics (e.g. a Car-Parrinello MD). If the chemical reaction is supposed to occur on the picosecond timescale, this approach should be enough to observe the reaction. The free energy barrier is considerably larger than kBT and/or the timescale for the reaction is much larger than picoseconds, the reaction cannot occur spontaneously during the simulation time of the quantum molecular dynamics and a steered or restrained/constrained molecular dynamics or more in general some enhanced sampling technique (e.g. metadynamics, umbrella sampling) has to be employed. When we have no information about the reaction, each of the above mentioned approach has to be attempted in sequence, also because each approach is preliminary for the subsequent one. Moreover, the approaches are listed in increasing order of complexity and computational requirements. Just to provide some estimates, for a system with a size similar to the one we are currently investigating, on a state-of-the-art workstation the first approach is supposed to take several hours/days of calculations, the second one requires order of weeks, while performing a meaningful simulation with the third approach needs some months. For this reason, in this tutorial we will focus mainly on the first two approaches. MOLECULAR DYNAMICS CP: Perform a molecular dynamics run. CP stands for a Car-Parrinello type of MD. ISOLATED MOLECULE:	Calculate the (quantum) ionic temperature assuming that the (quantum) system consists of an isolated molecule or cluster. QUENCH BO:	The wavefunction of the QM part is minimized at the beginning of the MD run. 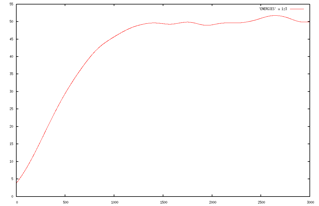 TEMPERATURE:	The initial temperature for the QM atoms in Kelvin is read from the next line: we start from 300 K since it is the temperature at which we equilibrate the system classically. EMASS:	The fictitious electron mass in atomic units for the CP dynamics is read from the next line. We choose 600 a.u. but ideally a careful set of tests should be done to verify that adiabaticity conditions are met30: this and the following parameter are the only parameters to tune in order to decouple the electronic and ionic degrees of freedom and therefore to minimize their energy transfer (adiabatic condition needed to perform a correct Car-Parrinello MD). TIMESTEP:	The time step in atomic units is read from the next line. We use the default time step of 5 a.u. ~ 0.12 fs. MAXSTEP:	The maximum number of MD steps for molecular dynamics to be performed. The value is read from the next line. TRAJECTORY SAMPLE:	Store the atomic positions, velocities and optionally forces every N time steps into the TRAJECTORY file. N is read from the next line. If N = 0 the trajectory file will not be written. STORE:	The RESTART file is updated every N steps. N is read from the next line. Default behavior is to write the file just at the end of the run. RESTFILE:	The number of distinct RESTART files (named RESTART.1, RESTART.2, etc.) generated during CPMD runs is read from the next line. The restart files are written in turn. Default is 1. QMMM_ORDER: The first line specifies the total number of atoms (NAT) and the number of quantum atoms (NATQ). The subsequent NAT lines contain for each atom 1) the GROMOS atom number as defined in the topology and coordinate files, 2) the internal CPMD atom number as in the TRAJECTORY file, 3) the internal species number (isp) and 4) the number in the list of atoms for this species NA(isp). The quantum atoms are specified in the first NATQ lines. CRD_INI.g96: Contains the positions of all atoms in the first frame of the simulation in GROMOS96 (extended) format (g96). CRD_FIN.g96: Contains the positions of all atoms in the last frame of the simulation in GROMOS96 (extended) format (g96). 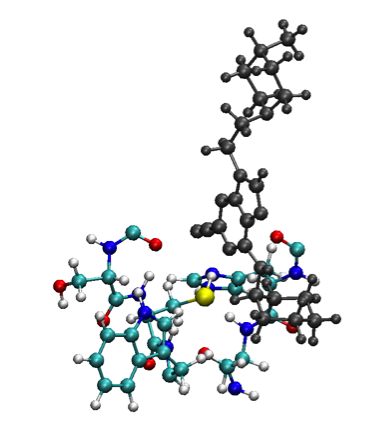 INTERACTING.pdb: Contains all the QM atoms and all the MM atoms in the NN list (see ELECTROSTATIC COUPLING in section 7) in a non-standard PDB-like format. The 5th column specifies the GROMOS atom number as defined in the topology file and in the coordinates file. The 10th column specifies the CPMD atom number as in the TRAJECTORY file. The quantum atoms are labeled by the residue name QUA. INTERACTING_NEW.pdb: The same as before, but it is created if the file INTERACTING.pdb is detected in the current working directory of the CPMD run. MM_CELL_TRANS: The QM system (atoms and wavefunction) is always re-centered in the given supercell. This file contains, the trajectory of the re-centering offset for the QM box. The first column is the frame number (NFI), followed by the x-, y-, and z-component of the cell-shift vector. ENERGIES: Contains all the energies along the trajectory. RESTART.<1,2,...>: Binary restart files containing all the information to restart the simulation. LATEST: A text file that contains the name of the last restart file written and the time that file has been overwritten. The last two files are present in a simpler full QM simulation with CPMD as well. USING SEED       123456 TO INIT. PSEUDO RANDOM NUMBER GEN.
From this part of the output you can verify that the TIMESTEP keyword was correctly recognized as well as the output options, and that there will be no temperature control, i.e. we were doing a microcanonical (NVE-ensemble) simulation. THE QM SYSTEM DOES NOT HAVE AN INTEGER CHARGE. DISTRIBUTED OVER THE NN ATOMS. CPMD issues warnings due to the positions of the boundaries between QM and MM parts: the cuts have been done within a charge group, i.e. a set of atoms whose sum of all the partial charges is zero. Therefore, the QM part does not have an integral part and -0.1144e of charge has been added to the background in order to compensate the non-zero value of the total charge in the QM part. EKINC: Kinetic energy of the “fictitious” electronic degrees of freedom of a Car-Parrinello MD. ECLASSIC: The total energy in a classical MD, but it is not the conserved quantity in a Car-Parrinello MD (ECLASSIC = EHAM - EKINC). EHAM:	Energy of the total Car-Parrinello Hamiltonian; the conserved quantity. DIS:	Mean squared displacement of the atoms from the initial coordinates. If the reaction has not occurred, then we can proceed with the next step, i.e. a QM/MM MD. Copy the following files from the previous calculation: cp ../gromos* . The RESTART keyword tells CPMD to read atomic coordinates, atomic velocities and the wavefunction from a restart file called RESTART. If the option LATEST is added to this line, the name of the restart file will be read in a text file named LATEST that CPMD creates every time it writes a restart file (if you adopt this restarting strategy, you should copy both RESTART.1 and LATEST from the previous calculation). The rest of the input file is the same as the annealing step and cannot be removed without making CPMD complain. Replace the gromos.crd entry for the COORDINATES keyword in the &QMMM section with annealing.g96. NOTE: Very probably the picture above does not correspond to your test. In fact, if you obtained the initial structure from a classical constrained molecular dynamics, the system is not already at or close to equilibrium as the test assumes! In that case, in this test without constrains you will observe the temperature increasing for a (very) long time before reaching equilibrium. Therefore, in this case for the test will be sufficient to focus on the energy of the fictitious electron (EKIN, column 2) and verify that it is oscillate without assuming an increasing trend. If the test is successful, we can take the configuration obtained by the annealing procedure and start heating the system up to the room temperature. There are several methods implemented in CPMD to heat the system. We choose to increase the target temperature by coupling the system to a thermostat and linearly increasing its target temperature at each time step by performing a usual Car-Parrinello MD. A simple Berendsen-type thermostat32 can be used in the heating phase: it does not fully preserve the correct canonical ensemble but we are not interested to this feature at this stage, while it is numerically fast and more stable than alternative algorithms. TEMPERATURE with the option RAMP; 3 numbers have to be specified on the line below the keyword: initial and target temperature in K and the ramping speed in K per atomic time unit (to get the change per time step you have to multiply it with the value of TIMESTEP). Read the initial temperature from the output file of the annealing procedure. BERENDSEN with the option IONS; 2 numbers has to be specified on the line below the keyword: the target temperature (the initial one in our case) and the time constant $\tau$ of the thermostat in a.u. (0.12 ps = 5000 a.u. is a reasonable value). Copy the following files from the previous calculation: cp ../gromos_mod* . We replace the annealing.g96 entry for the COORDINATES keyword in the &QMMM section with heating.g96. We want to restart from the previous wavefunction, coordinates and velocities since we want to use the temperature information from the RESTART file. Therefore, we keep the option VELOCITIES in the RESTART keyword and we will remove the TEMPERATURE keyword33. Regarding the choice of frequency (at which the energy transfer from/to the thermostat happens), you have only to pay attention not to select a resonance vibrational frequency of your system: a normal mode analysis can help to identify them. This way CPMD will create two restart files in sequence called RESTART.1, and RESTART.2, and it will overwrite them in the same sequence. (K+E1+L+N+X+Q+M)       TOTAL ENERGY =         -786.38895465 A.U. (K+E1+L+N+X)        TOTAL QM ENERGY =         -588.23597149 A.U. (Q)              TOTAL QM/MM ENERGY =           -0.02330326 A.U. (M)                 TOTAL MM ENERGY =         -197.90779871 A.U. (K)                  KINETIC ENERGY =          444.70658466 A.U. (E1=A-S+R)     ELECTROSTATIC ENERGY =         -468.48899310 A.U. (S)                           ESELF =          503.66462901 A.U. (R)                             ESR =           27.34136599 A.U. (L)    LOCAL PSEUDOPOTENTIAL ENERGY =         -425.81394778 A.U. (N)      N-L PSEUDOPOTENTIAL ENERGY =           33.22785637 A.U. (X)     EXCHANGE-CORRELATION ENERGY =         -171.86747163 A.U. GRADIENT CORRECTION ENERGY =           -8.25344627 A.U. Ensuring adiabaticity of Car-Parrinello MD consists of decoupling the electronic and nuclear subsystems and thus minimizing the energy transfer from ionic degrees of freedom to electronic ones. In this sense, the system during a Car-Parrinello MD should be kept in a metastable state. FIX STRUCTURE starts a group of individual constraints where the whole structural units can be fixed. The keyword is followed by the number of individual constraints on the next line. In our case we have only a distance constraint as specified in the DIST line. The value -999. instructs CPMD to constrain to the current value. The keyword GROWTH indicates that the constraint value should be changed at each time step with a rate of change given after the keyword (-0.0005) in units (bohr) per atomic time unit, i.e. independent from the current length of a time step. Note that in MD runs only the actual initial value (-999.) can be fixed. With this approach, the number of time steps has to be carefully calculated in order to reach the target value for the distance. by a harmonic potential having a spring constant 0.5 in a.u. where the SHOVE option of the FIX STRUCTURE keyword requires an additional entry at the end of each constraint line (only one in our case). This entry has to be either -1, 0, or 1. The constraint is then either fixed (0) or allowed to shrink (-1) or grow (1). The values of the Lagrange multipliers and of the actual constraint are printed in the file CONSTRAINT that is created in the current directory. In the folder ~/Tutorials/CPMD/3-Covalent_Binding_OLD_QMMM_Interface/10-QMMM_MD/STEERED you can find an attempt of a steered (constrained) MD. Does the expected chemical reaction between the nitrile carbon atom of the ligand and the sulfur atom of CYS25 take place? What is missing? Note that in a thorough analysis one should take into account all the protonation states with a probability let us say > 1%. This is in particular important if the protonation states varies in the region of the molecule that will be later described at quantum mechanical level (QM part). To have the list of options for any command of AmberTools, just type the name of the command followed by “-h” option in the terminal. For details and background of the RESP procedure see J. Phys. Chem, 1993, 97, 10269-10280. Probably, other “close contact” warnings will show up as well. These can be ignored because the correct contact distances will be sorted out during the equilibration phase (see next section). You can safely ignore error messages like WRTOPO: illegal bond type in ICQH! 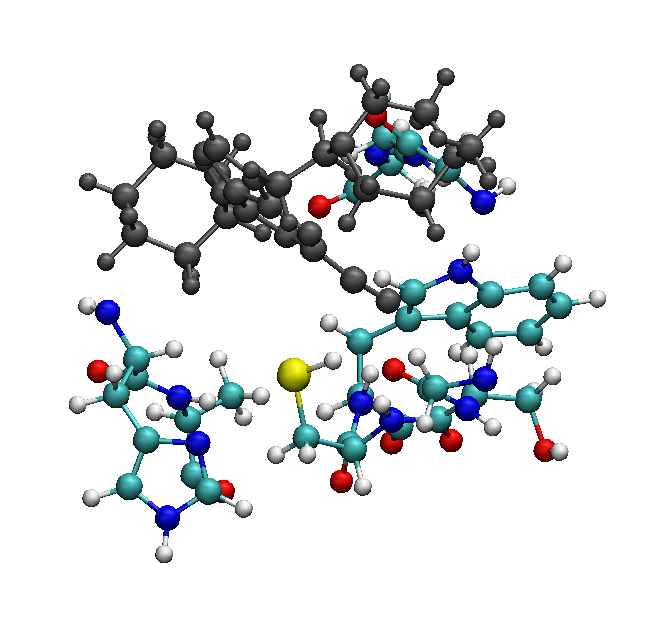 Note that in the context of the CPMD QM/MM input file, in a system like ours the protein, the ligand and the counterions have to be considered as a 1-molecule solute. E. Altmann, S. W. Cowan-Jacob and M. Missbach, J. Med. Chem. 2004, 47, 5833-5836.
is not relevant for the chemical reaction to occur. This would reduce the QM part to 75 atoms. This is also a possible, smaller and therefore computational less demanding QM part to start investigating. For an overview refer to the CPMD manual http://www.cpmd.org/documentation/cpmd-html-manual, the references therein and the book “Ab Initio Molecular Dynamics: Basic Theory and Advanced Methods” by D. Marx and J. Hutter (2009). A.D. Becke, J.Chem.Phys. 1993, 98, 5648-5652; C. Lee, W. Yang, R.G. Parr, Phys. Rev. B 1988, 37, 785-789. If LMAX is the only entry in this line, the program assumes that LMAX is the l for the local potential. You can use another local function by specifying the keyword ``LOC= ‘’ after LMAX separated by a comma. In addition, it is possible to assign the local potential to a further potential with the keyword ``SKIP= ‘’ (see the CPMD manual). G.J. Martyna and M. E. Tuckerman, J. Chem. Phys. 110, 2810 (1999). See section 11.16.6 of the CPMD reference manual for a complete list. O. A. v. Lilienfeld, D. Sebastiani, I. Tavernelli, and U. Rothlisberger, Phys. Rev. Lett. 93, 153004 (2004). Note that the picture reports the “index” of the atoms, while the “serial”, which corresponds at the sequential index inside gromos.crd file, in VMD differs for a unit: “serial” starts to count from 1, while “index” from 0. Sometimes, it could be worth trying such a partial optimization. The reader is invited to test this approach as well. 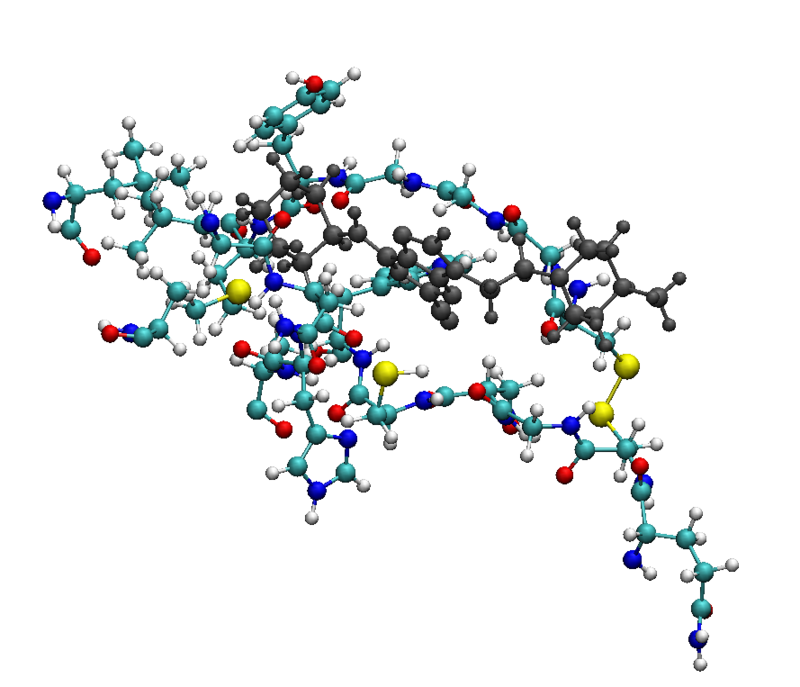 For a more exhaustive description of the CPMD log file see the other more introductory CPMD QM/MM tutorial that studies the acetone molecule in water. H. J. C. Berendsen, J. P. M. Postma, W. F. van Gunsteren, A. DiNola, J. R. Haak J. Chem. Phys, 81, 3684 (1984). Note that restarting with the velocities from the heating phase where we have employed the Berendsen thermostat algorithm is not always a good idea. In fact, this thermostat does not sample a correct canonical ensemble and therefore the velocity distribution of the atoms in the system could slightly deviate from the Maxwell one. However, the Nose-Hoover thermostat we employ in this step will adjust the velocity distribution during the first time steps and anyway the difference in the distribution can be important only for large systems and if high accuracy is required. S. Nosé and M. L. Klein, Mol. Phys. 50, 1055 (1983); S. Nosé, Mol. Phys. 52, 255 (1984); S. Nosé, J. Chem. Phys. 81, 511 (1984); S. Nosé, Prog. Theor. Phys. Suppl. 103, 1 (1991); W. G. Hoover, Phys. Rev. A 31, 1695 (1985).